Earning a raise is a difficult feat to accomplish in today’s economic landscape. Competition and reduced budgets are just a couple of obstacles in the way of increasing your salary. But what if all you need to focus on is a different mindset? 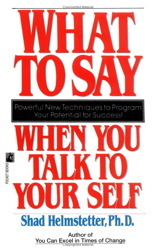 Author Shad Helmstetter, of What to Say When You Talk to Yourself, fills us in on the secret. Our earning potential is individually determined by each of us. The limits of our income are set by our own internal beliefs. If you want to earn more, you have to start by seeing yourself as worthy, deserving, and capable. Too many of us, when we want to increase our earnings, make the mistake of tackling the problem from the wrong end. We try to figure out how we can earn more money before we believe we are capable of doing it. Talk to yourself about your self-worth. When you start to create a new picture of yourself being worth more, your subconscious mind will help you and a way to go about earning it. I don’t want to oversimplify the task of making a significant increase in your financial net worth, but I have learned that doing so is far more dependent upon attitude, belief, and determination than on the position you are presently in today. If you are serious about wanting to increase your income, begin by giving yourself three weeks of self-talk for self-worth and financial worth—then set your goals and write your plan. When you determine who you really are inside, and what you are really capable of accomplishing, it is much easier to see what to do next. Start with your programming; the rest will follow. And once you get that raise, learn from the Master Tony Robbins how to find the right financial advisor to help you wisely invest your new, increased source of income. From acclaimed psychologist Dr. Shad Helmstetter comes a life‑changing guide to helping you help yourself through motivational self‑talk and positive thinking.Imagine relying on yourself to optimize your outlook, focus your plans, and keep you on top, in touch, and going for it! You can do it, by adopting the simple techniques of self‑talk, and understanding the power of key phrases like these: I choose my thoughts. No thought, at any time, can dwell in my mind without my permission.I have talents, skills and abilities—and I’m discovering new talents all the time.I take time to listen and communicate. I’m patient and understanding. It’s worth working at, and I do.I focus my attention on the things I can control. If l can’t affect it or direct it—I accept it.I know that what I believe about myself is what l will become—so I believe in the best for myself.Acclaimed psychologist Dr. Shad Helmstetter shows you how to make positive self‑talk a permanent habit. Give yourself the kind, loving, determined support you would give to your best friend. Harness the power of the ultimate motivator—you!